When attending the latest conference, I was once again reminded that some scientists and researchers are good at preparing and presenting their work, and others less so. While giving a good talk also depends on aspects such as the quality of the work and personal charisma, presentations often are not difficult to follow, or straight up uninteresting to listen to, because these are lacking, but because basic rules and guidelines on how to prepare and give a conference talk are not followed. In this context, a colleague and I prepared – partly in frustration, partly in aspiration that we may inspire to better talks at future conferences – a list of such basic guidelines that is presented below. Some presentations delve into the details of the work to be presented very fast, sometimes on the first slide, without motivating why the work is interesting or needed. If the audience does not understand why the problem is interesting to look at, and what basic problem it is trying to solve, it may not be interested in the work at all. Therefore, start the presentation with the big picture, with which I mean the really big picture. If you were to spend 30 seconds to explain to your grandmother or your child, what you are working on and why, how would you start? Start your presentation like that. A typical conference talk takes 15 to 20 minutes, which is a relatively short time to present new ideas and concepts in. If you try to squeeze in several ideas and points, there is a high risk that the audience won’t understand, or will only partially understand, any of them. Therefore, aim at presenting a single, or at most a few if they are closely related, overall point(s) of your work. This will increase the chance that the audience will understand and appreciate your work and ideas. This kind of focus on a single point also makes it easier to prepare a clean and sharp presentation. Your slides do not need to present all details of the work, as these can be found in your conference or journal paper. Instead, the slides should help you in presenting as clearly and convincingly as possible the overall ideas and outcome of the work. Therefore, minimize as much as possible text on your slides and use pictures to support your presentation. Pictures can be of systems or structures, diagrams to illustrate the work, graphical illustrations of data, or similar. Text in the form of names or titles may be needed to help the audience connect pictures to a given concept or idea. But text in the form of full sentences, or, worse, several full sentences (for example, copy-pasted from the paper) is never a good idea. A conference talk is often part of a long program, that may even consist of several parallel tracks, and attendees often go from talk to talk in different sessions. Therefore, and also because it simply is unprofessional not to, stay on schedule with your talk. If 20 minutes are allocated for presenting the speaker, giving the talk, and questions and discussion afterwards, then aim for a 15 minute talk. If you embrace the idea of presenting only a single key point of the work, it is always possible to motivate and present the work in this kind of time frame. If you struggle to stay within the allocated time, when you rehearse the talk, you are likely presenting details that can be left out. If a slide presents several distinct elements, right when it is first shown, it is difficult for the audience to know what to look at and in which order. Therefore, animate your slides. Let elements (names, graphs, pictures, etc.) appear on the slide as you need them in the story you are trying to tell. No matter how clear and beautiful slides you may have prepared, giving a good conference presentation is mostly about what you say and how you present it. If you only show up with your slides and an overall idea of what you want to say, you will likely spend too long time presenting your work in an unclear way. Sometimes, people take several minutes to explain even the simplest ideas because they did not think about how to present them clearly and concisely. Therefore, rehearse your talk at least a couple of times beforehand. In rehearsing, you will find out what words and expressions you will want to use, and you will sharpen your arguments and the sequence in which your work is most convincingly presented. 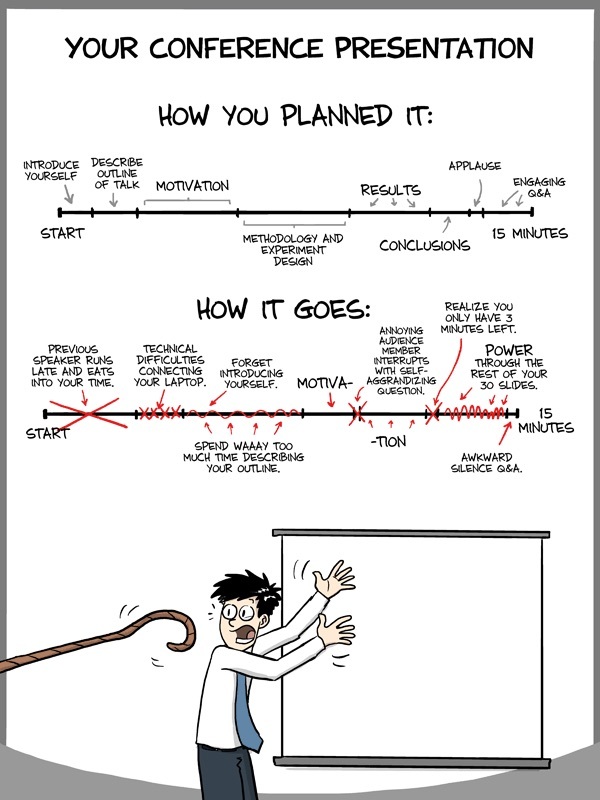 Even if you have uploaded your slides on the conference computer the same day, double check before the session begins that your presentation is still there, and that the slides look as you want them to. Also, bring the presentation on a USB stick that you keep in a pocket. There is nothing worse than being on stage only to realize that your slides are not there, and that you did not bring a copy on a USB stick. Use a combined laser pointer and slide shifter, which will free you from having to stand right in front of the computer to change slides. During the presentation, use the laser pointer to point at specific parts on your slides. Do not attempt to point with your finger, as nobody will be able to see what you are pointing at. Most larger conferences have such such laser pointers lying in each presentation room, but bring your own one just in case. If, in spite of the basic guideline of avoiding full sentences of text, you have a lot of text on your slides, then do not read the text out aloud. The audience is very likely to try to read the text, and if you start to read it as well, they likely won’t understand neither their own reading, nor your reading. If you really need text on your slides, then highlight the important parts (in color, bold face, underlined, or similar) and paraphrase the text when you present it. After giving the presentation, there might be questions or comments from the audience. To be polite and to avoid confusion, allow anyone asking a question or commenting on the work to finish their question or comment before attempting to answer. Thanks to my colleague Oscar Borries for discussions and input leading to this blog post.